What does the parenthetical "(minimum of 1)" mean on Election Day? 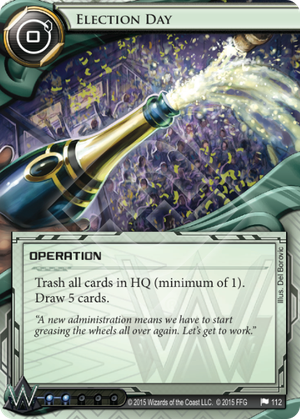 The text "(minimum of 1)" prohibits the Corp from playing Election Day unless at least one card is trashed by its effect. It's uncommon for me to play as Corp and think, "man, I really wish I could draw up." Usually it's when I only have 1-2 cards in hand, one of which is an agenda, and I want to pad my hand to reduce the odds of a score. Obviously I don't want to trash the agenda (barring Jackson on the table). So when else would you use Election Day? Maybe you've drained your hand with a Shipment from MirrorMorph? Maybe you're Gagarin and you've drained your hand spamming assets? Maybe you care less about what's trashed bc you have Museums? Maybe you are using Subcontract last , but not as part of a kill combo, and so you play your Hedge Fund or whatever and then play this to start next turn with a full hand. Rushy rushy! Maybe you're Argus, the runner just hit an unforeseen Snare! and has 2 tags with only 1 left. It's like turn 3 and you don't have any Scorches yet. So you ditch your hand in a desperate attempt to find some tag punishment. Maybe you're running Midseason Replacements in Weyland and the runner stole last turn. You don't have Midseasons or Consulting Visit in hand, so you trash HQ hoping to hit one, leaving you two s to play the CV. I don't know; it's feeling pretty niche to me. It's like a Corporate Shuffle that hurts you when you're flooded, and I haven't seen that card played much recently. More like "Election LAME" amirite??? Maybe try it in a rush deck with MirrorMorphs and Clone Suffrage Movements and crap. You know, ditching all those operations you don't need right now and Suffrage them back on the turn you want them. Lemme know how it goes. Talk about opportunities. This card creates them. Whether you are dealing with a difficult hand, or you need to quick refill your hand, I love what this card can do. I like that this is a Weyland card as it will help you reach those scorches quickly in a pinch. Just a well rounded draw card with a set back so it's not too powerful.